My short story “Fast Offering” was published in the Summer 2015 issue of Dialogue (if you’re not currently a subscriber you can buy a PDF copy of the story or issue individually — or even better sign up for a subscription and get access to it right away as well as to all of Dialogue’s archives). Electronic subscribers got access to it a couple of weeks ago. Print subscribers should soon receive their copy (if they haven’t already). Whatever way you access it, note that the issue also includes poems by AMVer S.P. Bailey and Emma Lou Thayne plus a bunch of other great writing. 1. “Fast Offering” is the most traditional Mormon short story I have written: it’s solidly in the faithful realism school of Mormon lit (e.g. contemporary literary fiction that deals directly with Mormon [often Utah Mormon] characters and assumes that the LDS Church is true but complicates what that means for the lives of the fictional characters depicted) and features a setting—a small southern Utah town (Kanab) in the early 1980s—a situation-adultery—and a character—a precocious deacon—that scream faithful realism so much that I almost didn’t send it into Dialogue. This is not a William Morris story, I thought, with a bit of chagrin. But, of course, it very much is. I just had a moment of denial about it. 2. I didn’t plan on writing this story. It snuck up on me. Indeed, the idea for it came to me a few months after I had decided to take a break from writing Mormon fiction except for the occasional Mormon Lit Blitz entry. What caused me to fall off the wagon? I read Hateship, Friendship, Courtship, Loveship, Marriage: Stories by Alice Munro in June 2014. Two things from that reading experience infected my mind and wouldn’t leave without the exorcism of writing the story: 1) the detailed, merciless attention Munro pays to the emotional lives of her characters and 2) the way that she is willing to switch point of view characters in a short story. I probably could have fought off the first. The second, however, was a formal experimentation thing and that’s like catnip to me and all of a sudden my mind came up with a uniquely Mormon way to transition point of view changes throughout a fairly standard literary fiction short story. The idea occurred in June. I wrote 1500 words of the story, sat on it for a few months, and then wrote the rest of it in October and November. 3. The story originally had two more point of view characters and was 3,000 words longer. Dialogue Journal’s wonderful fiction editor Heather Marx suggested that I pare down the povs and reduce the story down to a more traditional ~6,000-word length. She thought it needed to be more a short story and less the start of a novel. She was right. So I made the cuts. I’m very pleased with the end result. I may also have plans for the characters I axed. But right now I’m not focusing on Mormon fiction. I’m back on the wagon and writing only genre fiction. Of course, you never know what might knock me off it again. 4. “Fast Offering” takes place in Kanab, Utah, in the late spring of 1981. The main character Welden Shumway lives in the third ward of the Kanab Stake. I lived in the third ward of the Kanab Stake in 1981. The story isn’t autobiographical in the sense that I was only 9 in 1981, the adulterous couple and the house they live in are completely made up, and I was pretty happy to live in Kanab when I was kid and, other than a vague idea of attending BYU, never thought about whether I might need to leave the town up some day up until we moved away the summer I was 12. On the other hand, many of the physical details are pulled from memory. And the overall sense of what small town Mormon life is like is somewhat autobiographical, although it’s also been warped by the passage of time as well as my reading of Mormon fiction. This story might be as much Doug Thayer fiction as it is William Morris memory. I’m not sure how I feel about that. 5. After reading through the prior four points, I’m frustrated by the reluctance I sense, that it’s almost an apologetic, as if I have to explain the existence of the story because it conflicts with my own personal sense of who I am as a fiction writer and a voice in the world of Mormon Lit. There might be something to that. But I think there’s something else going on. “Fast Offering” feels like an inflection point for my Mormon fiction writing (that, remember, I’m not actively pursuing at the moment). I don’t think that it’s all that different from the stories in Dark Watch and other Mormon American stories (now available—your purchase supports my Mormon alternate history anthology) — not on the reader end. But on the author end it felt very different. And it’s frustrating to me that this is the story that feels like that. Partly because it is somewhat autobiographical; partly because it is faithful realism; partly because I don’t necessarily like the characters I write about in the story (even though I love them). It feels like both a step backward and a step forward. While every fiction writer needs to have a strong internal drive to produce fiction, very few writers will finish and revise stories in a vacuum with no hope of reaching an audience. Literary markets create incentives to invest in the time and effort it takes to produce fiction. Which is why I’m delighted that Boyd Jay Petersen has been named editor of Dialogue. There is no guarantee, of course, that he and his team will accept my work for publication. And I don’t know that I would have stopped if a different person had been named editor, but having a former president of the Association for Mormon Letters leading Dialogue, and, it specifically being Boyd, definitely amps up my interest in submitting and subscribing* to the journal. I say amp up. I should say instead: maintain. Or: not diminish. Because Kristine L. Haglund’s editorship** is a key reason that I have continued to write Mormon fiction instead of focusing solely on mainstream SF&F/lit fic. Frankly, I still can’t believe that she published a 10,000 word, Mormon, near future, post-apocalyptic, second person POV story that I wrote. And I doubt that I would have written the straight up Mormon literary fiction story I wrote last fall without there being the slight possibility that Dialogue might be interested in it. 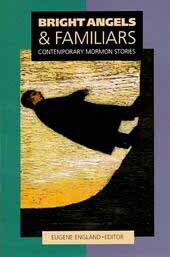 There’s no money in Mormon-themed short fiction. There is not much of an audience. But there is Dialogue‘s audience. Sure, much of the audience is more interested in the non-fiction. And yes, there’s also Sunstone. But when I’ve written Mormon fiction*** over the past few years, it’s been with Kristine and the Dialogue audience in mind. In fact, I don’t think that I would have even submitted to Dialogue if Kristine being appointed editor hadn’t caused me to take a closer look at the journal as a potential venue for my own work rather than just that place that publishes stuff by people I admire. Her editorship influenced my literary production. So while I probably shouldn’t be creating competition for myself, I do hope that Boyd’s looming tenure will give a bit of a shot in the arm to all of you who write or desire to write Mormon short fiction and poetry. I’ve already decided that I need to write something this year so I have it ready to submit in 2016. I hadn’t planned on doing so. I’m delighted that I have now changed my mind. *coincidentally, I actually subscribed for the first time a few days ago. I also gave them a $15 donation a couple of years ago because I discovered a PayPal account that had money it I had forgotten about and decided that that was the right place to redirect that discovery. I encourage you to not take after my bad example and become a more regular, active supporter than I have been. **And that of fiction editor Heather Marx, which Kristine was gracious enough to remind of in the comments below. ***Or at least anything over 1,500 words. The Mormon Lit Blitz is awesome, but some stories require more words. The liner notes for William’s story Dark Watch, which appears in the fall 2013 issue of Dialogue. The fall 2013 issue of Dialogue went live yesterday to electronic subscribers. Print editions are in the mail (or will soon be). I’m delighted and a bit awed that this issue devotes more than 20 pages to my story Dark Watch–it’s my longest published story to date. The way I usually describe it is: post-apocalyptic Mormon fiction told in alternating second person. 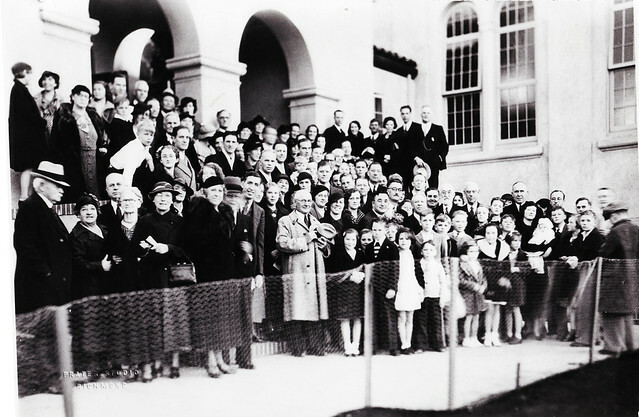 If you look closely in this picture of the Berkeley Ward building, you can find President Grant and a little girl named Mary Wallmann. Mary Wallmann has just passed away. Apropos of nothing, I present “Speculations: Wine III”. You can read the rest of Speculations: Wine as well as its companion piece Speculations: Oil in the Spring 2012 issue of Dialogue. If you are not a subscriber and have no desire to be one, then you can download Speculations: Wine/Oil for $1.99 via Dialogue‘s new Premium Digital Articles offering. If you refuse to eat beef Burgundy because of the wine, you might be a Mormon. If you refuse to eat beef Burgundy because of the beef, you might be a Mormon. If you don’t make beef Burgundy at home or order it in a restaurant but will eat it if served to you at a luncheon or in a friend’s home, you might be a Mormon. If you make beef Burgundy at home with a non-alcoholic red wine, you might be a Mormon. If you make your beef Burgundy with Two Buck Chuck and bring it to a rolling boil for a good twenty minutes, you might be a Mormon. If you make your beef Burgundy with a California Burgundy and let it gently simmer for five minutes, you might be a Mormon. If you make your beef Burgundy with a French Burgundy and take a quick sip before pouring the wine in, you might be a Mormon. If you have a glass of wine along with your beef Burgundy, you might be a Mormon. But only as long as you either (1) feel as if you’re doing something totally transgressive, or (2) feel guilty about it afterwards. Or both. If you make beef bourguignon instead of beef Burgundy, then you might be a Mormon. But you definitely are a food snob. Repent and snob no more! If you make bÅ“uf bourguignon instead of beef Burgundy, then you served a mission to France. We’re so sorry. Now get over yourself and call it beef Burgundy like the rest of us. Liners notes for Speculations: Oil and Speculations: Wine, which appear in the spring 2012 edition of Dialogue. “Speculations: Wine” and “Speculations: Oil” appear in the Spring 2012 issue of Dialogue: A Journal of Mormon Thought. They are companion pieces to “Speculations: Trees,” which was published in Irreantum. Several of the pieces in “Speculations: Oil” come from the same flurry of writing that led to “Speculations: Trees.” When I finished Oil, I decided to submit it to Dialogue. It was accepted. And then it fell through the cracks. Kristine Haglund, the editor, was very apologetic about that when I finally decided to ask about it. But to be honest, I was kind of glad that it had because in the meantime I had come up with some ideas for “Speculations: Wine” and asked if I could finish that and then resubmit the two works together. Kristine agreed. This was in the spring of 2011. Because of Monsters & Mormons, I didn’t have a whole lot of time to work on Wine, but then in the fall of 2011, I felt the urge to procrastinate other tasks, and went ahead and wrote most of it. I’m glad I did because just a couple of weeks later, Kristine emailed and asked if I could have things ready for the next issue. I’m lucky she was proactive about it because who knows how long I would have waited around before finishing it and resubmitting. Here’s a tip for my fellow writers: if an editor expresses interest in an unfinished piece, don’t let too much time go by before you finish it. I must admit I would find it difficult to talk badly about this story if it deserved it (it doesn’t) as Karen is a friend of mine and, arguably, a large part of the reason life has resulted in me doing story-by-story reviews of a two-decade-old Mormon-short-story collection. After graduating from BYU I joined the AML-List and took a menial job. With my brain untaxed at work, I aimed my thinking at the AML-List. Which ignored me. Sometimes the email I rewrote three times couldn’t get past the moderators because the day’s volume had already been capped off with a pair of three-sentence witticisms from Richard Dutcher; but I kept trying to get attention, jumping and waving my arms from the back of the room. Anyway, fastforward a couple years and Karen Rosenbaum, then fiction editor at Dialogue, picked up my short story “The Widower,” and edited it to a new level of excellence. This was an important learning experience for me; plus, it let me feel that maybe the world of Mormon letters had a place for me after all.